My son’s special education reading services have been discontinued. Since he was age seven in second grade (he is now thirteen and finishing eighth grade) he has been receiving specially designed reading instruction. This has taken the form of a number of different programs – Orton Gillingham, Wilson Reading System, Read Naturally, Project Read, and others. He has been taught such things as vowel teams, open syllables, closed syllables, and the floss and fizzle rule. In the public school system, the reading instruction has been provided through an Individualized Education Plan (IEP). Before reading services could be removed from my son’s IEP, testing had to be completed to ensure that he demonstrated proficiency in basic reading skills and reading comprehension. Services should not and cannot be removed from an IEP without these proper procedures being followed. This is good news for the child. So, what does this discontinuation of services look like for our family? For my son, it is like being released. When he enters high school in the Fall, he is free to choose and have more subjects in his schedule. For myself, I have to appraise these changes. Sometimes making sense of the test results is a challenge. The testing may give scores and labels such as low average or high average that enable weaknesses and strengths to be spotted, but ideally, being able to compare the recent testing with previous testing gives a better idea of improvements made, or not. It seems that this is how the Gray Oral Reading Test (GORT) should be used. 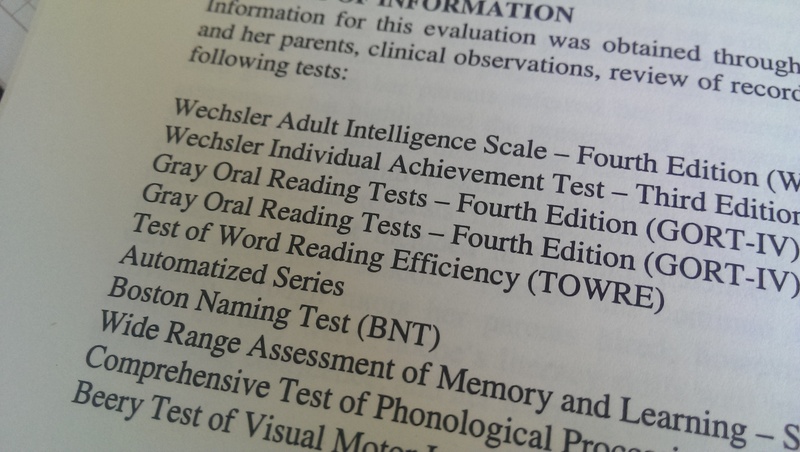 Comparing the results of this test with results from the same test taken some years previously, my son’s weakness in reading accuracy and fluency was still evident. Dyslexia never goes away. Perhaps the testing for visual stress later this summer may help shed light on this weakness. On the Woodcock Reading Mastery test my son’s word decoding and comprehension on this test came out in the average to high average range. My understanding of dyslexia is that often reading, or decoding words, can take considerable effort for someone with dyslexia, leaving little opportunity to comprehend the passage just read. I have found that when the hard work of decoding is removed, for instance when I have read the same passage to my dyslexic daughter that she has struggled to read, her comprehension of the passage has greatly increased. However, this does not seem to be the case for my son. He performed very well in both reading and comprehension. While my son’s weaknesses in reading still exist, when I put these together with the positive feedback I have received from his teachers about performance and progress in school this year, and with the removal of reading support allowing an expansion of subject choices for his final four years of school, I think the discontinuation of reading services is okay. In any case, services can always be reinstated, if needed.